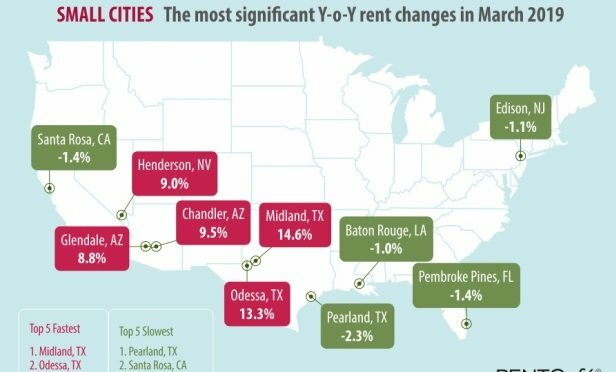 Aggressive increases in the Southwest have kept Phoenix and Las Vegas at the top of the list for rent growth in the past year while the fastest and slowest yearly rent changes occurred in Midland/Odessa. The fastest and slowest yearly rent changes occurred in small Texas cities: Midland, Odessa and Pearland. HOUSTON—The beginning of the rental season recorded rent increases of 3.2%, the lowest annual growth in more than six months, according to a RENTCafe monthly report with data compiled from actual rents charged in the 253 largest US cities. Compared to last year’s figures, the March average national rent of $1,430 per month is $44 higher.